It didn’t take long for the initial enthusiasm around No Man’s Sky to morph into something well beyond the control of its creators. Calcified by the hype-driven marketing around the game, the pitch for No Man’s Sky underwent a metamorphosis. It went from ‘a procedural-generated survival game from the makers of Joe Danger’ to something else entirely. An interactive experience so immersive and engaging and sprawling in both content and continuity that it promised to be the last game players would ever need to buy. Eventually, reality had to snap back in back in. But not until it was too late. In the lead-up to its arrival, the fervor around No Man’s Sky was hyperbolic at best and borderline-religious at worst. It was also catastrophically and utterly divorced from the reality of its actual development. There should be little surprise that the backlash was as myopic and caustic as it was. 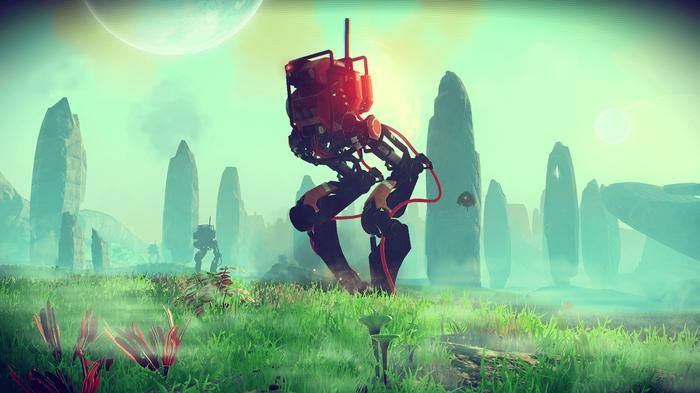 Since then, No Man’s Sky has been undergoing a second metamorphosis. This time, things are a little more low-key. Bit by bit, Hello Games have been digging themselves out of the ashes with a series of major content updates for the game. First, they added additional base-building mechanics with the Foundation update. Then, they fleshed out the game’s single-player and shared-universe systems with the Pathfinder and Atlas Rising updates. Now, they’re making the jump to full-blown multiplayer (and the Xbox One) with the arrival of No Man’s Sky NEXT. Technically speaking, everything is technically new this time around for me. Having already gone through my own cycle of hype-and-disappointment over a procgen space exploration game with Spore, I skipped No Man’s Sky when it first released. For those like me - or those who were pushed away by vitriolic reputation attached to No Man’s Sky - the gist of the game is as elegant as it is intriguing. You wake up on a remote planet in a crashed spaceship. You receive a cryptic message from someone - or something - called The Atlas. Your second? Repair your ship. Then? Escape and explore the cosmos. Almost everything in No Man’s Sky: NEXT essentially comes down to the process of gathering and crafting to meet and manage this hierarchy of needs. But where that loop takes you that is entirely up to you. You can kick it with the game’s various space-faring alien civilizations or go hunting for alien artifacts. Become a bounty-hunter, explorer, builder or merchant. The galaxy is your oyster. If you’re someone who felt burned by No Man’s Sky as it was at launch, NEXT does a lot of heavy-lifting to try and bring you back into the fold. On this side of the event horizon, there have been a staggering amount of additions and changes. 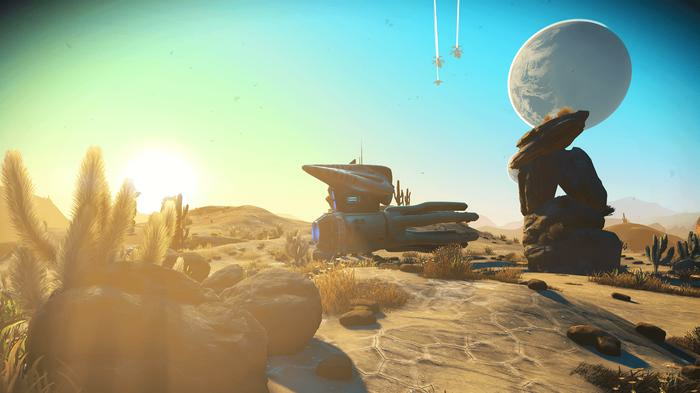 Even if the fundamentals haven’t changed, it definitely feels like No Man’s Sky has evolved. In the era of NEXT, everything is more streamlined. Plus there’s a whole lot more to actually do. 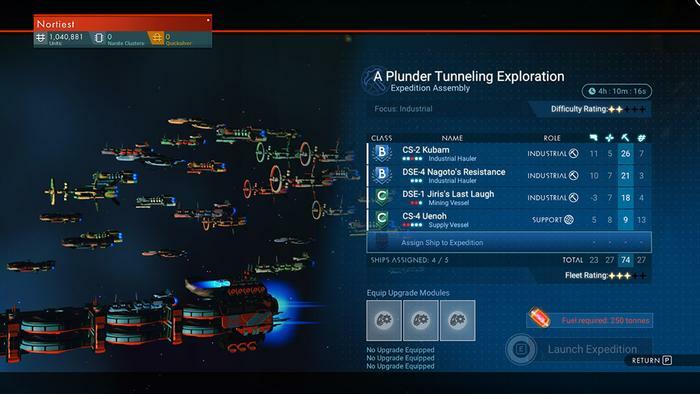 There are new planetary vehicles, base-building, interplanetary portals and, as advertised, proper co-operative multiplayer for up to four players. You can even begin to build your own armada of freighter ships. Once assembled, you can even send this fleet out to complete missions or call them in when you need backup. It would be misleading to say that these additions make No Man’s Sky: NEXT a whole new game or the game it should have been at launch. But they do serve to make it a concretely better game than that of the past. Still, no matter your ambitions, the core loop in No Man’s Sky is very much the same. Pursuing your space fantasy of choice always comes down to an identical cycle of wandering alien landscapes, zapping things with your mining laser to collect resources and then using them to craft structures and upgrades. In theory: being a space-pirate, mercantile maven, intrepid explorer or cosmic commandant should feel like different pursuits. In reality, they’re all just different shades of this same busy-work. 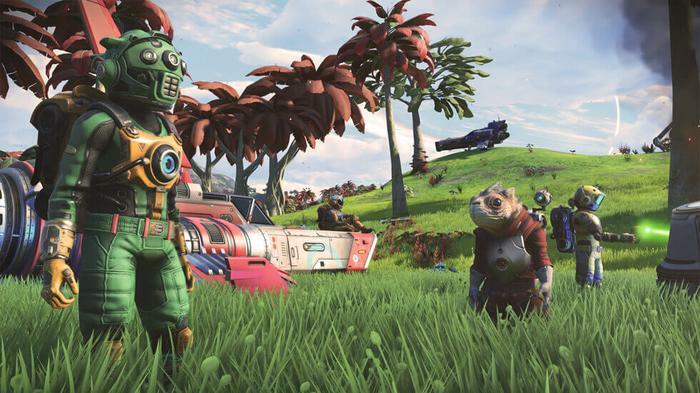 NEXT changes a lot of things about No Man’s Sky - but it doesn’t change this. If you got bored after a dozen or so hours at launch, it probably won’t take you too many more hours before that boredom begins to creep back in. Especially if you don’t have friends to play with online. 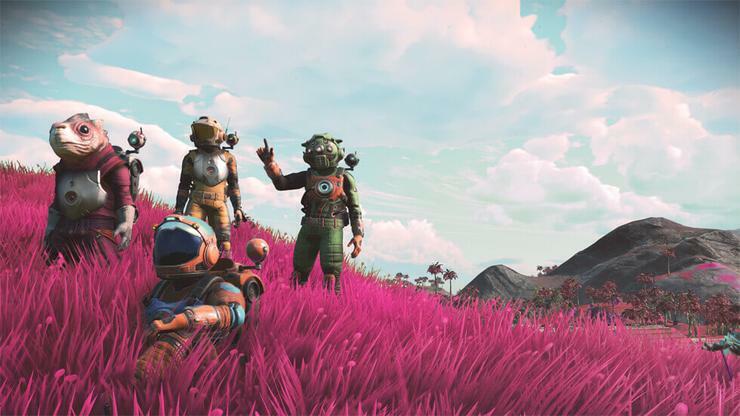 NEXT makes the best parts of No Man’s Sky deeper, more diverse and accessible - but Hello Games haven’t tinkered with the broader flavor of the universe all that much. To play devil’s advocate here: not that this busywork is necessarily bad. Sure, I get the case that it can be a little dull and repetitive. But as fans of No Man’s Sky will contest, there’s definitely something zen or meditative to it. It’s almost like a curious combination of Spore and Minecraft. At times, it even blends with the high-concept trappings of the game’s science-fiction universe to produce charming micro-narratives. A pit stop for fuel on a seemingly-uninhabited moon can quickly spiral into an adventure of its own. At their best, the mechanics can paint the framework’s canvas with the most galvanizing of colors. If this was a game I had the chance to play in high school or university, I could easily see myself sinking hours upon hours into it, amassing resources, reputation and rewards aplenty. Of course, if you were to string it all out, there’s more to do in No Man’s Sky than anyone could have time to accomplish within even a lifetime of play. 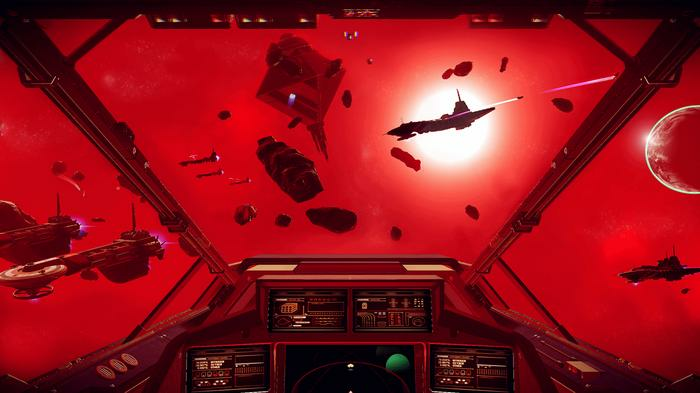 Courtesy of a few post-launch refinements, Hello Games’ lofty ambitions to build a universe simulator now delivers impressive results. However, like Minecraft, the exact mileage you’re going to get out of those results is ultimately going to come down to how much time you’re willing to put in. I don’t know if I’ll ever have the time to fulfill my ambitions with No Man’s Sky - but I know I want to. Even if the odds are stacked against it, the literal and metaphorical stars in No Man's Sky sometimes align to produce majestic results. And when these constellations can't be found anywhere else, sometimes is all you need. 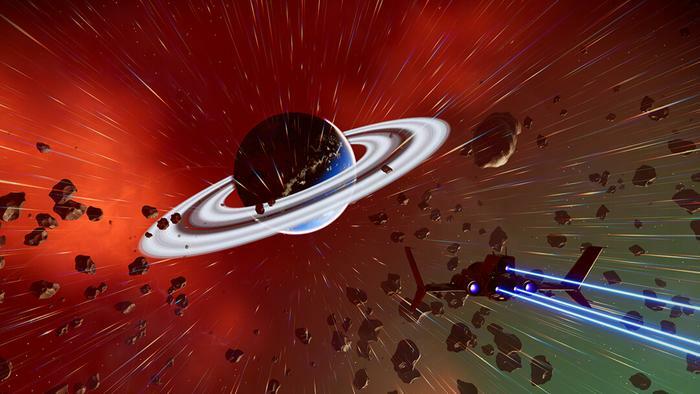 No Man's Sky: NEXT is available on PC, PS4 and Xbox One.